If you are a woman who does paper craft or yarn weaving, chances are, people will brush you off as a hobbyist dabbling in handicraft, or at best, a maker on Etsy, the international e-commerce site for handmade goods. But an artist making art? Two female artists in Singapore who work with paper and yarn, however, refuse to be given short shrift; Hazel Lim and Ginette Chittick are reclaiming the medium and technique for art. 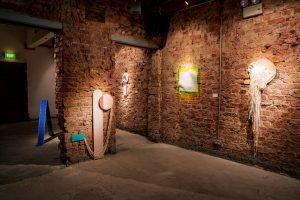 Their first entreaty – a joint exhibition of paper and yarn works at the UltraSuperNew Gallery in Rowell Road. The show explores the place of yarn and paper at the intersections of art, design and craft. On display are Lim’s paper sculptures where dainty, folded origami squares are interlocked to form large, supple, textile-like pieces, some of which drape over stands, or are framed on the wall by acrylic sheets. 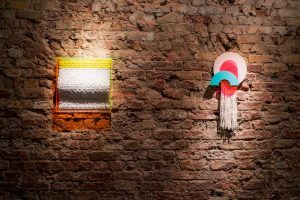 Chittick’s sculptural yarn works, on the other hand, hang from the wall and incorporate elements of wood and coloured acrylic sheets. Lim’s work (left), borrowed its title, A Rainbow In My Mind, from a note her daughter wrote to her. On the right is Chittick’s piece, Coming Into. 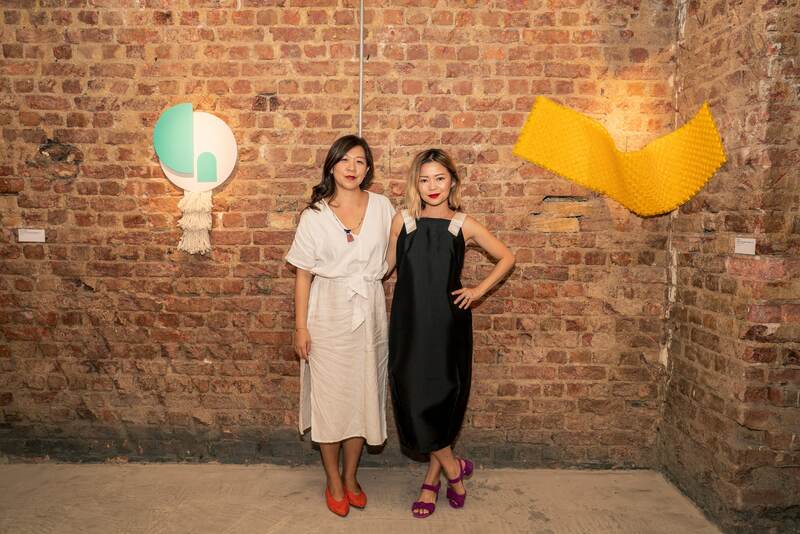 Lim is unabashed about how her body of paper-fold works, which she started in the mid-2000s, is at heart an homage to her mother and aunts who have a habit of gathering at home to make origami and crochet items. Yet the body of work has also evolved, she says. In the exhibition, her works use paper weave to explore the play of light and colour that is fundamental to painting. She has also opened herself up to inspiration from her young daughter, borrowing the line, “a rainbow in my mind”, from a thank you-note her daughter wrote her, as the title of a work. For Chittick, who picked up yarn weaving in 2015 on the spur of the moment and out of curiosity, this exhibition has seen her move from her usual tapestry works to experiment with more weaving techniques and ways of constructing her work. Going with the creative flow though, does not mean effortless ease. In fact, their works of art are labour-intensive. Lim suffered repetitive strain on her thumb from folding the small pieces of paper, and for Chittick, part of the yarn-making process involves beating the fibres against a wall to relax them. Details on Planes & Envelopes here.